0% with Splenda and fresh berries, it's good. I promise! The 2% is to heavy for me. I'll take your word. I think I'll try truvia though. I tried it by the spoon and oiiiii. My pouch protested. Now the SF pudding sounds like something I could really like. I'll pick up a 0% cause you and VSGMOM told me to and I think you two are kinda awesome. I add Torani SF vanilla syrup to my Greek yogurt. Makes it much more tasty. I have most recently been getting the Chobani. 14 grms of protein! Oh, your posts always just crack me up! Good for you for trying the Fage, I agree, if you don't like it for sweet, I'll bet you like it for sour cream replacement. thanks, Julie. If the time allows (mother in law is here!) I'm gonna make a dip recipe and post it. I mix in sugar free syrups (like the DaVinci or Torani). I also use plain greek yogurt (2% here, too, I don't do the fat free crap) in place of sour cream in ALL recipes that call for it. It's very versatile, you can make it sweet or savory. I also make smoothie kits (idea from Bariatric Foodie). I freeze plain greek yogurt into ice cube trays, put two cubes into a baggie with 1/2 cup frozen, no sugar added fruit. Cheaper than the Yoplait smoothie kits and it adds a little protein boost to my smoothies, plus nice texture. I haven't owned an ice cube tray since we moved to our house and have an icemaker in the fridge. lol. I have some frozen fruit in the fridge and I would make smoothies, but for some reason, the lid to the blender has decided to go MIA. I bought ice cube trays just to do that, LOL. Some strawberries and blueberries soaked in Truvia, then stirred into the 0% makes a great bedtime snack. Hi in protien, not bad in carbs, and fat free. 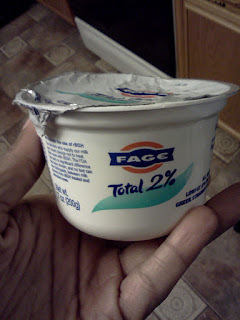 Can you believe that I've never even had the inclination to TRY Greek style yogurt as a dip? It's not that I don't think it will taste good, it's just that I don't want to. Lol. But for real, when I was just a few months out from surgery, that's all I kept seeing: eat Greek yogurt, eat Greek yogurt, eat Greek yogurt. What no one mentioned was that my body, my tastebuds, my DS wouldn't WANT it. So for months I avoided it. I stuck to Light & Fit and not feeling the least little sad about it. Then one day, over a year later, a coworker offered me hers from her lunch. I ate it timidly, AND FELL IN LOVE. You just figured this out? LOL! Glad you did. I've been using Eggface's dip recipes for awhile know. She mixed Fage into avocado, blue cheese, roasted red peppers, feta, caramelized onions,Torani syrups, etc. I agree that the flavored ones are not so good. I tried pineapple once and yes, it was like sour cream with a hint on pineapple.